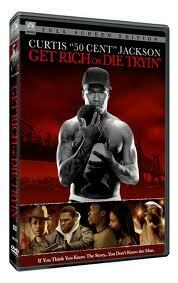 Hip-hop star 50 Cent makes his movie debut in this hard-edged urban drama inspired by the rapper's own life. Marcus (Curtis "50 Cent" Jackson, aka 50 Cent) grew up in a tough New York neighborhood and was left to fend for himself after the death of his mother when he was a kid. Marcus fell in with a powerful crime boss (Bill Duke) who gave him an opportunity to make a good living -- by selling drugs. While Marcus has misgivings about his life of crime and has an interest in expressing himself as a rap artist, his success as a dealer makes it hard for him to get away from the life. However, when a heist goes wrong and Marcus is shot several times, he has a change of heart and decides to leave his old life behind. He begins pursuing his dream of making it in music, and with the support of his girlfriend (Joy Bryant) he begins recording a demo tape. Marcus' new songs are inspired by the gritty realities of his old life on the street, but just as it looks like he might be able to land a record deal, he discovers that some of his old business associates aren't too happy about Marcus telling folks about their actions.